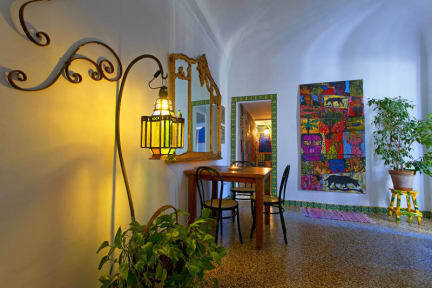 Artepalermo is for people who want an authentic experience instead of an impersonal hotel. 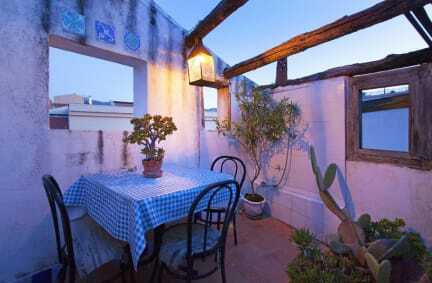 It is situated in the historical center, in a lane, at the top floor of an old house and surrounded by squares, terraces, lanes, churches, washing and markets. There are two guestrooms, both with balcony or terrace, a shared sitting room, a roof terrace and a kitchen where guests can cook. You have your own bathroom but it is not in your room. There is no lift. We are a dutch woman (an artist), a tunesian man and a sicilian dog, and we speak english, italian, german, spanish, french, portughese, dutch and arabic. The place is easy to reach from the airport, bus and train station and port.